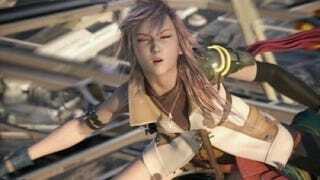 Final Fantasy XIII on the Xbox 360 and the PS3 are different. But that's not all. • Vibration: "However, how powerful the vibration is has been changed dramatically," writes the site. "You seldom feel it during gameplay and when you do, it's so weak it's barely worth having." • Save Points: "In the Japanese release, when you exit the save menu, you could hold down the analogue stick while the screen quickly switched back to gameplay and you'd immediately start running," explains Final Fantasy-XIII.net. "Now if you do that you'll stay motionless." According to the site, players need to release the analogue stick and try once again. • Shroud Menu: This was called the "Smoke Menu" in the Japanese version and allowed players to run around with this menu open and use it when players saw fit. "Now when you press L1 to open the shroud menu you can't move," adds the site. "This means you have to make sure you're the perfect distance from your target to use an aerosol or the time limit will run out and you'll end up wasting it." Not sure why these small tweaks were made for the International version of the game.